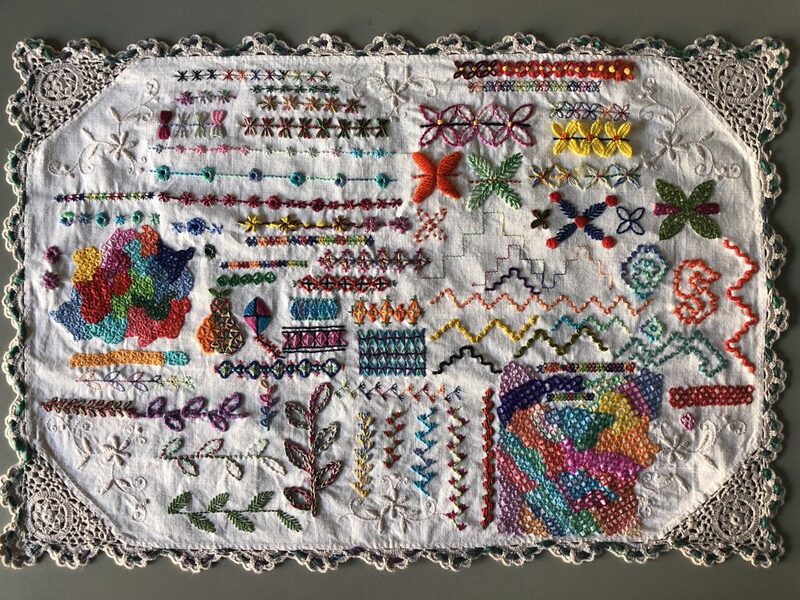 Anyone who has been following my embroidery adventures for the past couple of years will know I’m completely addicted to Dropcloth embroidery samplers by textile artist Rebecca Ringquist. 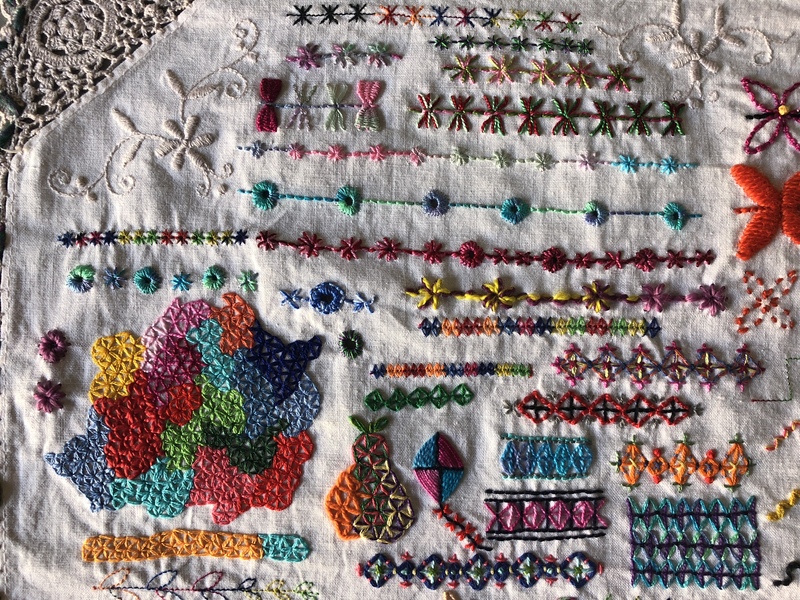 In March this year, Creativebug hosted a daily stitching challenge to coincide with the release of Rebecca’s latest sampler, “drawing stitches” and I joined in. (I’ve been blogging my stitching out of order so you may have seen projects with these stitches here recently). 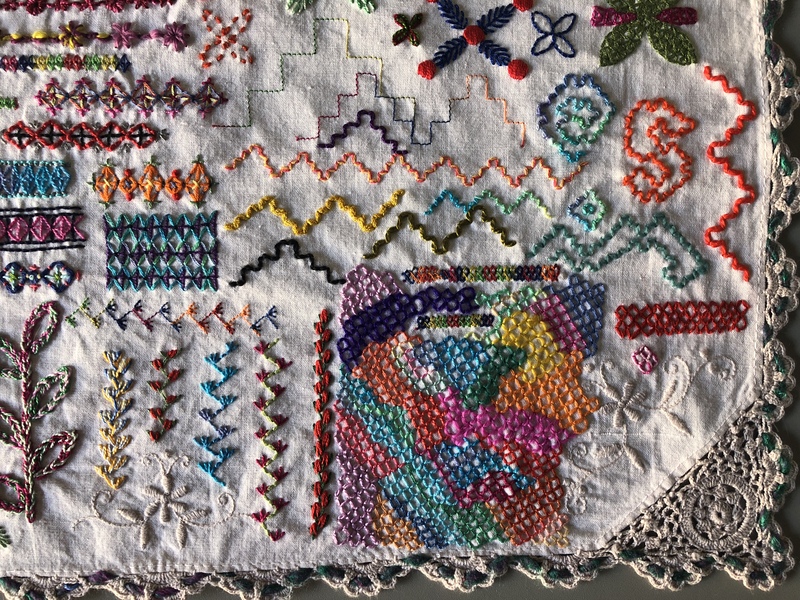 I really enjoyed this stitch along because not only did I learn new stitches, but Rebecca also has a way of creating a way of making stitches that give you the most opportunity for adding more colour and texture. For example, it had never occurred to me to work the tails of long tail chain first, so they could be worked in two colours. 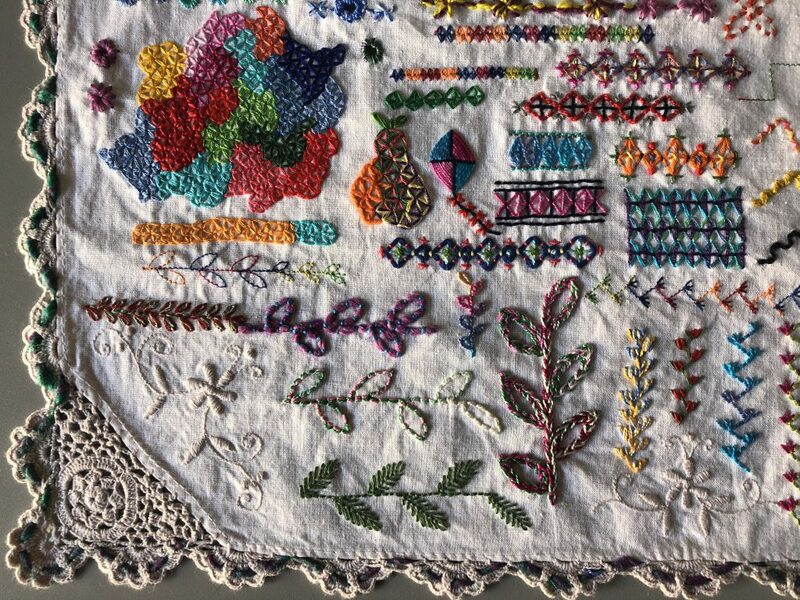 The class is online permanently over on Creativebug, which you can find here: Daily Embroidery Challenge with Rebecca Ringquist and you can purchase the sampler from the Dropcloth Samplers Etsy Store. 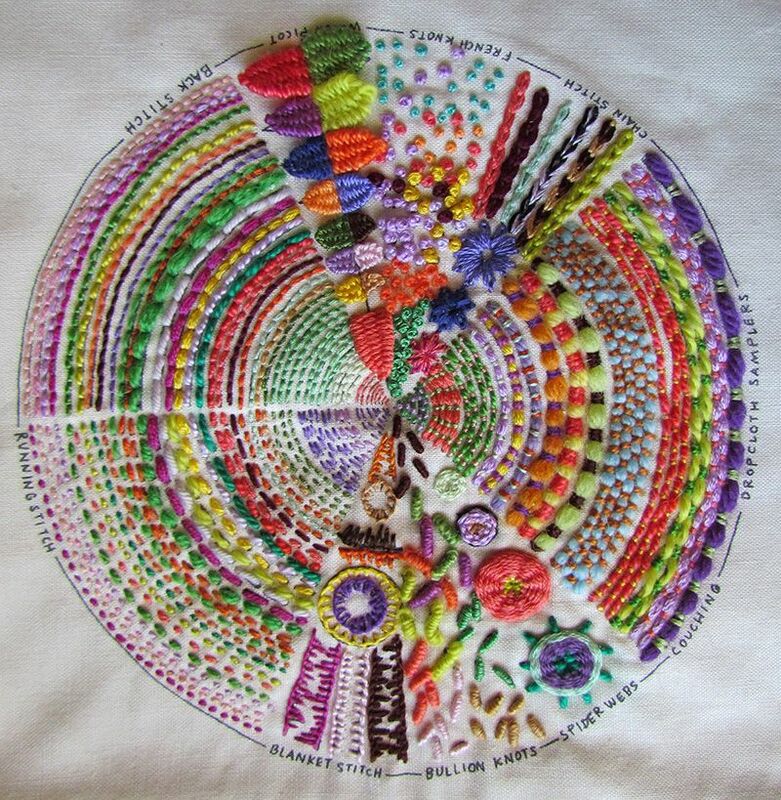 You don’t need the sampler to stitch along though, all you need is thread, a hoop and some fabric! This post contains affiliate links to Creativebug. All opinions in this post regarding the Creativebug platform are the honest opinions of the author. I will only ever promote products and services I have tested and enjoy. Or to be more accurate, the Original’s sequel. Presenting my latest finished embroidery, The Original’s Sequel from Dropcloth Samplers by Rebecca Ringquist (that’s a non-affiliate link to her Etsy shop, in case you’d like to try it too). 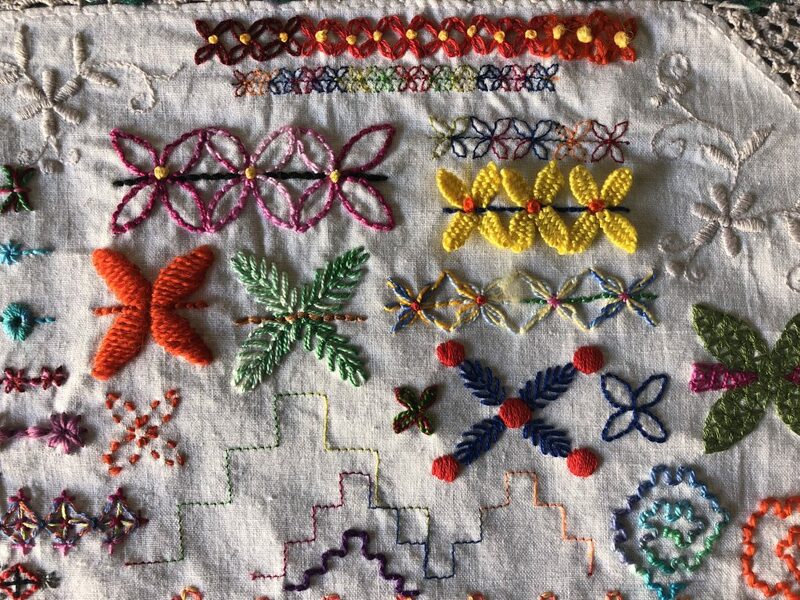 Even though I’ve learnt a hundred or more new stitches in the last three years embroidering samplers for the TAST challenges, there were a couple on this sampler I hadn’t tried before. Japanese darning, wave stitch, turkey work, bokhara couching, and this particular version of tête de boeuf were all new for me. I keep petting the turkey work, I jammed the rows together as closely as I possibly could and it’s incredibly fluffy. 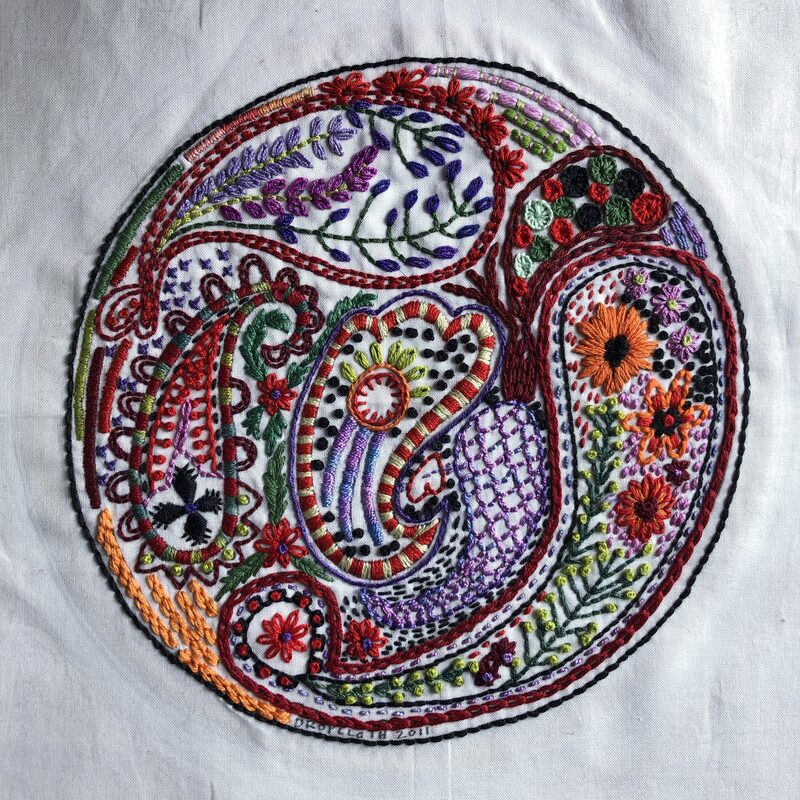 I’m going to try it in wool at some stage, to see if I can get good enough at it to make shaped flowers and squirrels and things with the thread trimmed to create a 3D motif. I followed Rebecca’s Creativebug class “Advanced Embroidery Sampler ” to learn these new stitches. I especially liked how the stitches each have their own chapter so I could jump back and forth to whatever I wanted to embroider next, and didn’t have to watch the instructions for the stitches I already knew. I’m also really fond of the needle woven leaves on the left. I’ve done them with chain stitches before, but this way of working them seems much more stable and more firmly attached to the fabric. Especially if you’re working a long leaf like these. 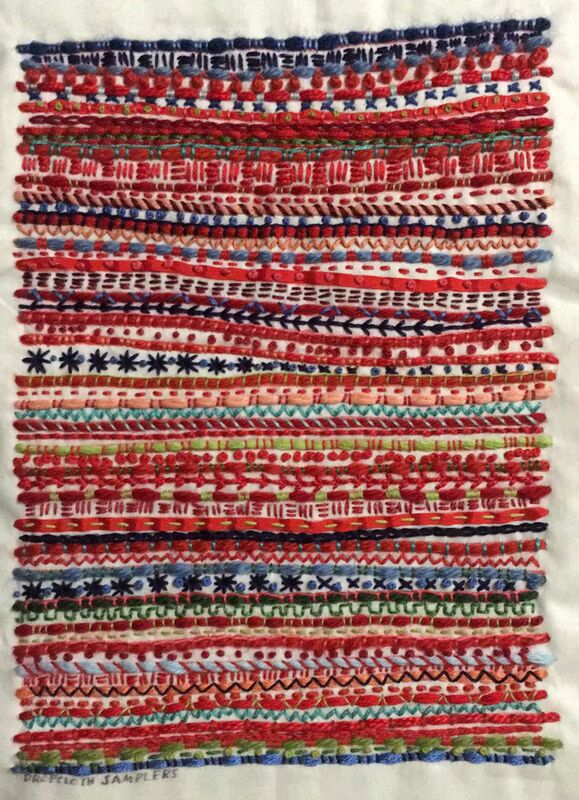 I’ve noticed that I seem to like very textural stitches whenever I work samplers, but I don’t often use them when I design actual projects myself. I’m going to have to do something about that! Well that’s it for my embroidery projects at the moment. I found a cool thing on Trove that I want to show you though, and it will include a tutorial so I’d better get working on it. And I have a couple of new lace edgings to update. And now that I’ve shown you all my TAST samplers, I need to make them into books. I hope to get back to regular blogging and posting free stuff and tutorials for you, so come back regularly. If you’d like to be notified about new posts via email, you can subscribe to the blog over there on the left, (or underneath this post if you’re on a mobile device). The Creativebug link in this post is an affiliate link. You can be assured that I only promote products and services that I personally use and enjoy. I have an admission to make. 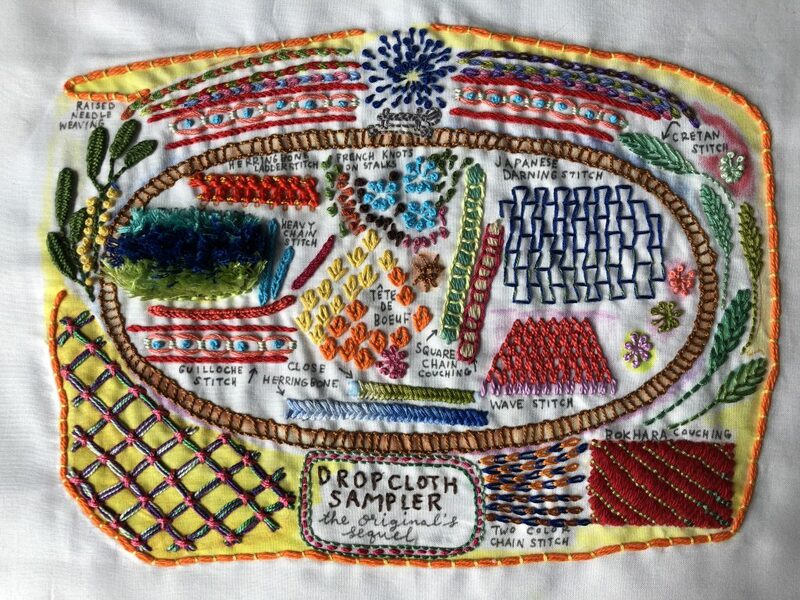 Even though I have embroidered more than 120 original “investigative” samplers in the last few years, sometimes I love nothing more than working on a pre-printed sampler so I don’t have to design anything, and I often get to try something I never would have thought of myself. 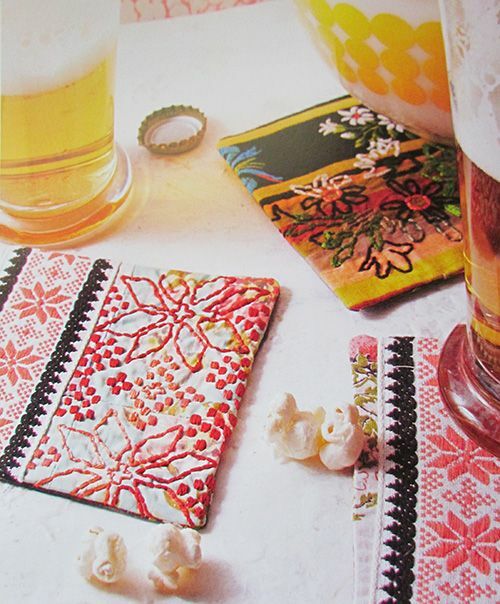 My favourite pre-printed samplers are Dropcloth Samplers by Rebecca Ringquist. 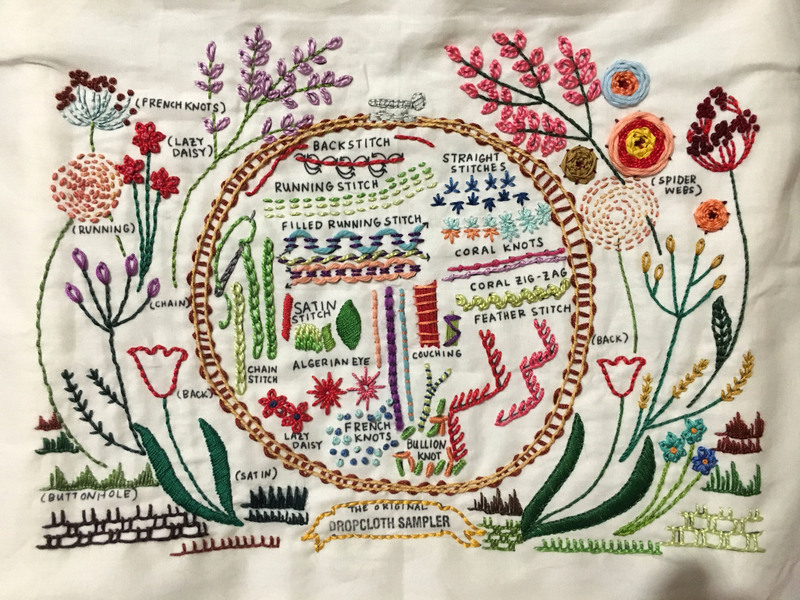 You may have seen my previous post about her book, Embroidery Workshops, in which I showed my finished sampler that comes with the book. Well, I just finished my fourth Dropcloth sampler, Paisley. Yes, that’s right, my fourth. and I have the Sequel sampler all ironed and ready to hoop. 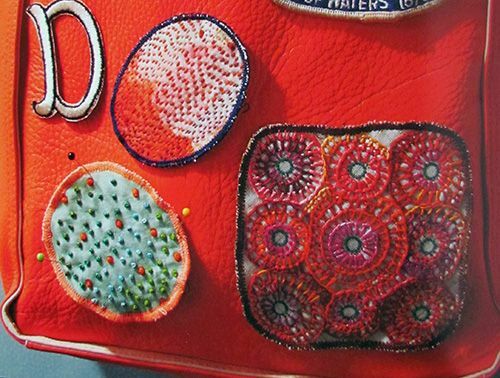 I love how densely stitched the red stripe and paisley samplers are, and every one people embroider are completely different. I love having guidelines and still have the freedom to choose my own threads and change things up if I feel like it (which is why my hoop on the Original Sampler is a bit wild). 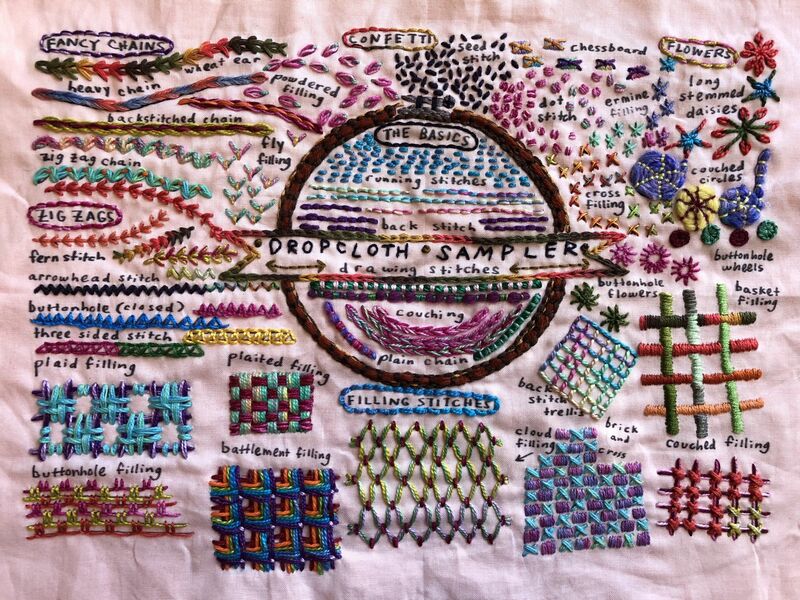 Check out the hashtag #dropclothsamplers on Instagram for lots of inspirational photos and to see other people’s versions of Dropcloth samplers. If you’re new to embroidery, or looking for a project that’s a bit out of the ordinary Rebecca also has some classes on Creativebug, including the Original Embroidery Sampler, the Advanced Embroidery Sampler (aka The Sequel Sampler), Embroidery Transfer Techniques , Layered Floral Embroidery (I’m going to try this soon), Embroidered Heirloom Napkins , Embroidered Kids Pillow , Embroidered Photo Ornament and the Embroidered Embellished Skirt. You don’t need to buy any of her samplers to do any of the workshops. 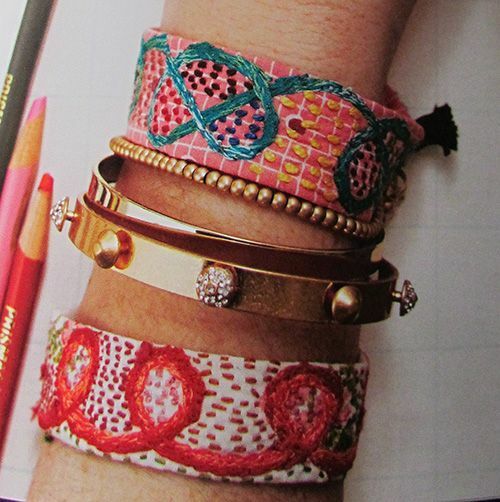 All you need is fabric, thread and a hoop. For a limited time you can get a 14-day free trial to Creativebug and save 60% at Joann Fabric and Craft Stores. This post contains affiliate links to Creativebug. The links to Dropcloth Samplers on Etsy are not affiliate links. Rest assured, I only link to products and services I enjoy, and believe my visitors might like too. Before the Take a Stitch Tuesday 2015 embroidery challenge began I was already working on some other embroidered samplers. I’ve already shown you my Dorset Feather Stitchery sampler, but here is the other one. 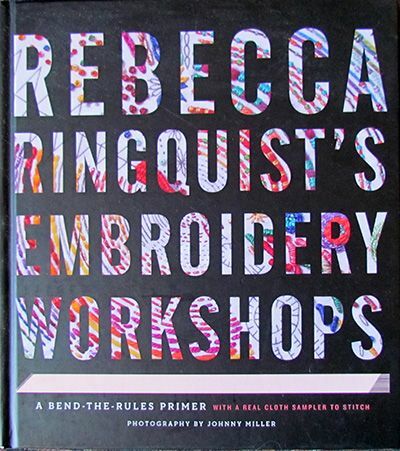 The Drop Cloth Sampler from Rebecca Ringquists Embroidery Workshops: A Bend-the-Rules Primer (Amazon affiliate link). I finished this in early September. There are a lot of reviews of the book online already so I’m just going to show you a couple of my favourite projects. I prefer technique books to project books and the thing that makes this book stand out from many these days is that each project introduces an idea or way of working that can be expanded on and used with other projects.